How good is the farm, and what does it mean this year? Is Texas’ farm one of the best or the very best? Regardless, it’s stocked. Texas placed seven prospects in Baseball America’s top 100 (with two more just outside) and six in Baseball Prospectus. The depth is also amazing, with third base being the only major weakness. Texas had five of the top 54 picks in the June 2007 draft and received five players for Mark Teixeira the following month. Somehow, first baseman Justin Smoak dropped into Texas’ lap in last year’s draft. A renewed commitment to Latin America has produced several key signings. That said, the number of prospects expected to make major contributions to the 2009 edition is relatively small. Texas surprisingly named Elvis Andrus (see below) the starting shortstop. Catcher Taylor Teagarden made a strong impression in limited play and will be no worse than Jarrod Saltalamacchia’s caddy on Opening Day. Middle reliever Warner Madrigal, still technically a prospect depending on whose criteria you prefer, might be optioned this spring but definitely will pitch for the Rangers at some point. In terms of major league impact, everyone else is a question mark. Texas’ two best pitching prospects, 20-year-old righty Neftali Feliz and 22-year-old lefty Derek Holland, reached Double-A toward the end of 2008. Both could visit Arlington this season. Smoak has impressed but is no less than a year away. Texas also needs to figure out what to do with offense-oriented catcher Max Ramirez. Aside from college-aged draftees Julio Borbon, a center fielder, and right-handed pitcher Tommy Hunter, most of the other top prospects will be in Single-A or Double-A to begin the season. As of the end of 2008, right-handed pitcher Eric Hurley seemed most likely to make the biggest contribution this year, but he succumbed to shoulder surgery and is essentially lost for the season. Thus, barring major trades or excessive injuries, Texas ought to rank at or near the top in prospects again in 2010. Can ownership and management deliver? So, general manager Jon Daniels and staff deserve credit for developing a glorious minor-league system. It will be for naught unless transformed into victories at the highest level. Is Daniels capable of effecting that transformation? Opinions vary widely. Daniels has made several good trades involving veterans (Teixeira, Eric Gagne) and one gutsy win-win swap (Edinson Volquez for Josh Hamilton). Several other trades were disasters, resulting in the losses of Chris Young, Adrian Gonzalez, John Danks and others for only modest returns. Nolan Ryan became team president before 2008, and after a season mostly spent observing, he’s begun to assert his opinions. In particular, he criticized the organization’s conditioning and wants to see pitchers work deeper into games, especially at the higher levels. Ryan and Daniels share blunt honesty and commitment to winning, but they come from very different backgrounds. To date, they’ve coexisted fairly well. The one constant during Texas’ depressing 21st century is owner Tom Hicks. To his credit, Hicks has never shied from spending lavishly on draft picks and Latin talent. He’s also shown admirable patience regarding Daniels’ rebuilding effort. However, he’s not known for steadfastness. He’s habitually made strong commitments (signing Alex Rodriguez to a 10-year deal, extending manager Buck Showalter) and quickly reversed course (trading A-Rod after three seasons, firing Showalter before the extension began). Texas lost 89 games in 2001, Rodriguez’ first with Texas. The haphazard collection of player and management transactions during the next two years continues to haunt the franchise. Though the parts are in place for several years of playoff contention during the 2010s, it’s not hard to envision a serious upper-level housecleaning (whether needed or not) before postseason baseball is realized. In March 2007, Texas signed Michael Young to a five-year extension that begins this season. At that time, only four regular major league shortstops were aged 32 or older. Young turned 32 last fall. Daniels and company surely knew that Young would require a position switch during his extension years, but I bet they didn’t send $80 million his way with the intention of moving him before he’d collected his first upgraded paycheck. Young himself certainly didn’t expect a move just months after winning his first Gold Glove. He made his displeasure public, then reluctantly accepted his fate and wisely reverted to “whatever helps the team” bromides. Texas has bequeathed Young’s position to Elvis Andrus, acquired for Teixeira in 2007 along with starting catcher Jarrod Saltalamacchia, starting pitcher Matt Harrison and top prospect Neftali Feliz. He won’t turn 21 until August and hasn’t played above Double-A. Andrus is in many respects the opposite of Young defensively, for better and worse. Young doesn’t have much range but is strong-armed and sure-handed. Andrus has tremendous range and a good arm but made 32 errors last year, often due to lack of focus on routine plays. Andrus has displayed adequate contact and walk skills and minimal power in the minors. Given his age, he might generate some more pop down the line, but slugging isn’t in his future. Though he’s blazingly fast (54 stolen bases last year), his bat may keep him in the No. 9 spot in the long run. It will this year, certainly. Makeup isn’t a problem. He expects to lead, and being among the youngest in his league throughout his career hasn’t fazed him. Indeed, his maturity partly explains management’s decision. Andrus and Young should be among baseball’s worst-hitting left sides of the infield this season. However, they’ll be a huge improvement defensively on the 2008 version: Young at short and the execrable trio of Hank Blalock, Chris Davis and Ramon Vazquez at third. Whether or not they’re a net gain in 2009, the idea is to fully prepare Andrus for 2010, when Texas expects to contend for the division. 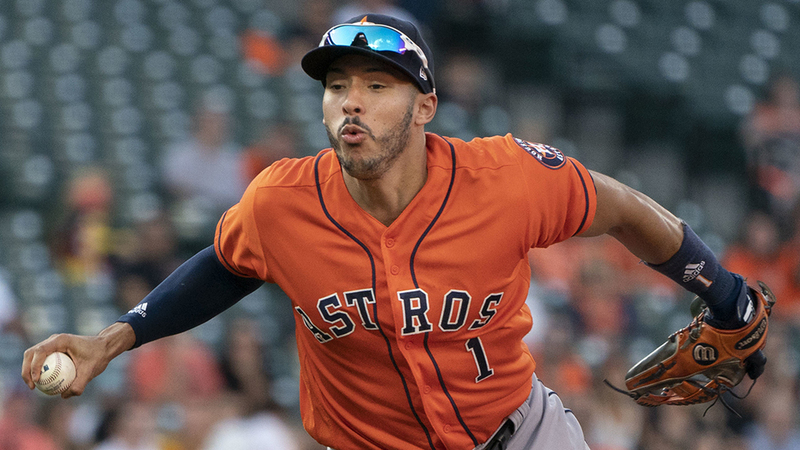 Which outfielders last until April and beyond? Texas signed Andruw Jones to a minor-league deal despite having four outfielders worthy of regular play already under contract plus competent backup Brandon Boggs. Texas also has quasi-outfielder Frank Catalanotto, if only because he’s owed a minimum $6 million over the next two years. Jones is batting .258/.324/.419 this spring, showing flashes of both adequacy and utter hopelessness. He can opt out on March 20 if not placed on the major league roster. Should he make the team, Texas almost certainly options Boggs and waives Catalanotto. Neither of those moves is problematic, but Jones’ presence and Hamilton’s will also banish two among Nelson Cruz, Marlon Byrd and David Murphy to the bench every night. Arguably, all three are better players at this point. This brings up a pet peeve of mine, the “low risk” signing. All signings are high risk if handled improperly. Texas signed Swingin’ Sammy Sosa to a minor-league deal in 2007. He manhandled some overmatched spring training hurlers, so Texas gave him the cleanup spot and 450 plate appearances despite an OBP that hovered around .300. But hey, he belted his 600th homer wearing Ranger blue! A subset of this peeve involves hitting coach Rudy Jaramillo. The phrase “let Rudy fix him” is applied to every offseason signing. Jaramilllo deserves his sterling reputation, having temporarily or permanently resurrected the bats of Mark DeRosa, Gary Matthews, Byrd and others. However, even he can’t resurrect the dead (Richard Hidalgo, Ben Broussard, Phil Nevin). Though still just 31, Jones might be a lost cause. Does the rotation have a prayer? The last pitcher originally signed by the Rangers to qualify for the ERA title while still with Texas was Doug Davis in 2001. Their division mates have a combined 41 seasons of at least 162 innings from homegrown pitchers since then. Meanwhile, Chris Young, John Danks, Edinson Volquez and (improbably) Andres Galarraga form a solid quartet of ex-Rangers. At least Volquez brought equal or better value in return. Harrison is most likely to break the dry spell. The 23-year-old made steady improvement during his debut season that included a September shutout at Oakland, Though lacking much upside, he should evolve into a capable inning-eater. Scott Feldman might also break the 162-inning barrier. The converted reliever deserves some sort of award, if not the MVP, for taking the ball every fifth day last year and sparing Texas from using scarier alternatives. That said, Feldman’s more placeholder than solution. You might suffer an injury just thinking about Brandon McCarthy, who already has dealt with shoulder pain this spring (successfully, to date) after logging an aggregate 124 innings during 2007-2008. Ranger fans were bemused to learn that McCarthy has largely foregone his alleged “plus” curve in favor of a slider. Texas’ failure to retain its best young pitching is only half the current problem. The other half lies with would-be rotation anchors Kevin Millwood and Vicente Padilla. The two have a combined 5.14 ERA and an average of 158 innings during the past two years. Millwood hasn’t cleared 180 innings since 2006 and must do so this season to vest his $11 million for 2010. The Ranger hold a $12 million option on Padilla; even if they decline, Padilla’s pitching for his next paycheck somewhere. Is 180 innings of league-average production too much to ask? It shouldn’t be. Fallback/replacement candidates include Tommy Hunter, Dustin Nippert, Jason Jennings and even Kris Benson. Texas could exceed 81 wins if the rotation provides a level of service just a notch above terrible.